Louis’ books have been enjoyed and embraced by thousands around the world interested in improving their lives, the lives of their children and accelerating people engagement and business results in their organizations. His words, entertaining stories, thought-provoking ideas, and simple and actionable takeaways are inspiring and moving people’s hearts and minds towards a better world. A highly effective, step-by-step guide to discovering your life’s purpose, finding a career you love, and living a life of intense fulfillment each and every day. Do you love your job? Your current career? Your life? Or do you go to work feeling disengaged, uninspired or maybe even dreading the day? In HOW TO FIND A JOB, CAREER AND LIFE YOU LOVE, Louis Efron (Forbes and Huffington Post contributor and award-winning Fortune 200 human resources executive) reveals how to find purpose, fulfillment and more happiness in your career and life. His distinct self-discovery process helps you create new excitement and vigor in your current job and career. If you're ready for change, he'll help you find new direction that brings you in alignment with your purpose and goals. Through his proven process, you'll make job and career decisions for the right reasons, plus look at life options from uniquely different angles. If you are feeling at all unfulfilled, uninspired, or disengaged in your job, career or life, or battling low self-confidence, this is the definitive book for you. Start your 30 day+ challenge today (included inside) and begin to proactively design the fulfilling, engaging life you desire and deserve. A portion of this book’s proceeds go towards improving the diagnosis, treatment and care for children with cancer in the developing world with the charity World Child Cancer USA. Already have the book and need the Book Tools? Read a FREE Chapter from the book! Enter your name and email and access one of my favorite chapters now! Louis Efron is not afraid to color outside the lines. His book transforms what could have been another staid, traditional Human Resources piece and converts the text into a personal journey. One he walks with his readers. Like my book Built on Values: Creating an Enviable Culture that Outperforms the Competition, Louis includes helpful tools and resources to aid his readers in accomplishing their goals. This practical book will provide you with the jump start you need to wake up to a job and life you love. There are so many books on the market today that make you think and others that make you act. What is so terrific about Louis’ book is that it makes you do both. If you are serious about having a truly engaging career that you are passionate about and can’t wait to get to work each day rather than just a job you dread, then you need to read this book. The book is loaded with tips, tools and homework for you to do, but the journey in the end will be well worth it. The idea of work-life balance is eroding very quickly. We spend too much time at work for it to be anything other than deeply satisfying and meaningful. However, for most of us, none of our high school or college coursework was focused on finding meaning through our work. Louis' book is exactly what we should be teaching in high school and college. Louis presents a step-by-step guide for how to connect 'who you are' with 'what you do'. If you are looking for a life of meaning, read this book immediately. How to Find a Job, Career and Life You Love” was a game changer and a lifeline for me. By applying the practical tools that Louis provided, I was able to find out where and why I was losing my power and most importantly, how to get it back. After each chapter I was left with so many takeaways and clear guidance on where I was headed next. Louis is a visionary and a healer do not be fooled by his youthful appearance--he is full of wisdom beyond his years. Thank you Louis for rekindling the passion in me that I thought was forever lost--for this and for so much more I am forever grateful! Louis' book is a little gem of a tool. It's for every person who has ever yearned to live their right and purposeful life, the one dreamt of but hasn't quite been put into action. As a human resources executive who has spent thirty years coaching, advising and helping people with their career aspirations, this book will be a tremendous kickstarter. Instead of plodding through the career that life has thrown at you, you can learn how to re-set, recalibrate what is truly important, meaningful and energizing and determine with intentionality the life and career you are meant to live. Bravo Louis on How to Find a Job, Career and Life you Love. As the CEO of two successful recruitment firms, I know the importance of placing people in the right jobs to ensure their success and happiness. This process starts with candidates understanding their purpose: what they were put on Earth to do. 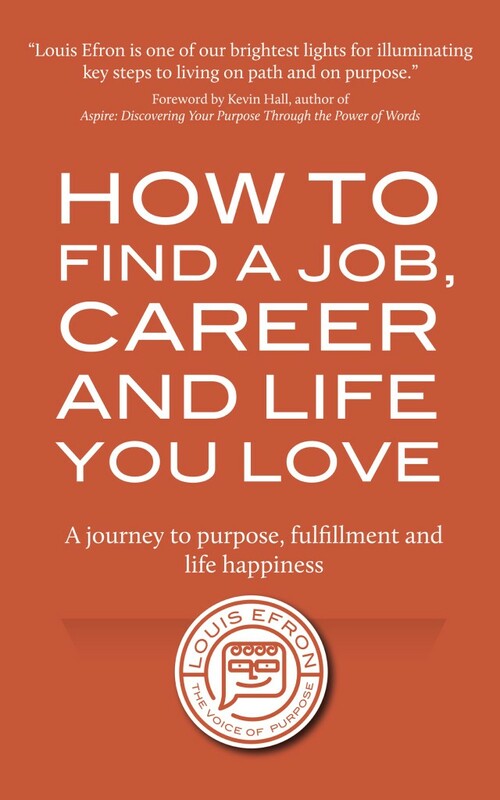 Louis' book and process helps job candidates and employees find their purpose. It is suggested reading for everyone applying for positions through my firms. How to Find a Job, Career and Life You Love is a game changer for job seekers, employees and every organization. Louis is one of the rare break of leaders that can touch you emotionally and intellectually. How to Find a Job, Career and Life You Love will resonate with you because it makes sense rationally and reaches out to you personally. Louis is a leader who brings his intuition and blends it with insight and facts to make you enthused to read more and begin acting! Read this book only if you’re ready to do some soul searching that results in real-life planning. Louis' book is a must for anyone who is willing to take action and live life with more purpose. How to Find a Job, Career and Life You Love teaches you what everyone needs to know and do to live a happy, fulfilled and successful life. Specifically, how to discover your purpose, what you will be happiest doing for a job and career plus how to start living the life you want and deserve. If you follow Louis' advice, your life will change for the better. Whenever I pick up a book filled with "expert advice", my first question is, " ... is this person truly an expert and is what they're telling me for real?" Well, with Louis Efron, it takes about a page and a half to be sure ... he's not only the real deal, but his writing style is some of the most transparent, vulnerable, relevant and timely you'll ever read! This book made me reevaluate my entire purpose for living and has had a profound impact on my work with corporate clients and how they can best optimize employee engagement. With his unique experience in theatre and HR, Louis gets right down to the personal stuff and hits on what truly makes people want to do and be their best. The idea of combining Employee Purpose with Corporate Purpose is a great way to help people be everything they can be as human beings, but can't help to maximize ROI and improve culture ... why didn't I think of this? This book is not only a fascinating read, but is destined to be part of a new paradigm in corporate Human Resources strategy. Hungry for more? Get connected! Connect with Louis on LinkedIN to stay in the conversation.